What is an SoC? Hint: the “S” stands for Server. The acronym “SoC” generally refers to “System on a Chip”. But with SoCs entering the server space, it is also taking on a new meaning: “Server on a Chip”. An SoC is a large scale integration of processor cores, memory controllers, on-chip and off-chip memories, peripheral controllers, accelerators, and custom IP (intellectual property) for specific applications and uses. As Moore’s law continues, chip process geometries shrink, allowing more transistors to reside on the same area of silicon. Traditionally, server processors have used this new real estate to add more cores. But there are better alternatives than just adding more cores for certain applications. Higher performance – significantly faster and wider internal busses compared to those found in a multi-chip or multi-board solution. Lower power – wider range of power optimization techniques can be employed in SoCs including power gating, changing bus speeds depending upon utilization, dynamic voltage and frequency scaling of processor cores and peripherals, multiple power domains, and a number of others. Additionally, having peripherals on chip avoids power hungry PHYs (analog drivers that need to drive signals between chips and boards). Higher density – fewer components to buy, consume power, and fail. Deeper integration of peripheral controllers and fabric interconnect technologies allow a number of advantages that cannot normally be achieved by having to go through standard bridges like PCIe. One or two processor chips, often with integrated memory controllers. One or two chips for processor chipsets providing a range of functions like Southbridge peripherals and PCIe. A PCIe connected Ethernet NIC, either chip or PCIe board. In today’s volume servers, this is typically one or two 1 Gb Ethernet interfaces. A PCIe connected SATA controller, either chip or PCIe board. Controller chip for an SD card and/or USB. An extra cost, optional BMC (baseboard management controller) providing out of band system management control. 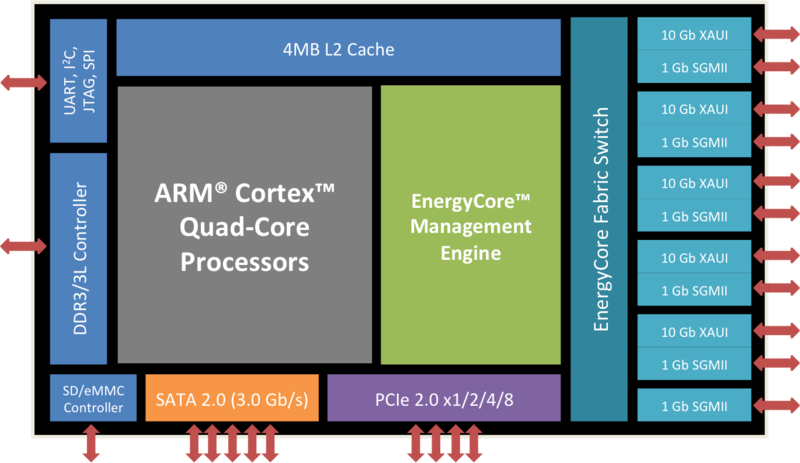 A quad-core Cortex A9 CPU, configured for server workloads. The largest L2 cache that you’ll find on an ARM server: 4 MB with ECC. A server class memory subsystem including a wide, high-performance 72-bit DDR3/3L memory controller, also including ECC. Integrated peripheral controllers that have direct DMA interfaces to the internal SoC busses without the PCIe overhead. Standard server peripheral controllers like multiple-lanes of SATA, multiple Ethernet controllers (both 1 Gb and 10 Gb), even an SD/eMMC controller for local boot or scratchpad storage, are all integrated on-chip. If your server needs to connect to devices that are not integrated, there are four dual-mode PCIe controllers, supporting both root-complex and target modes, in both x4 and x8 configurations. Instead of an optional (and expensive) BMC, management is built onto every chip, providing a sophisticated server management system that provides both in-band and out-of-band IPMI/DCMI system management interfaces along with dynamic power and fabric management. A deeply integrated, power and performance-optimized fabric interconnect, which we’ll talk about in a future blog entry. And all of this is designed with performance, power, and cost optimized servers in mind, delivering the industry leading performance/Watt and performance/Watt/$ servers. With all the typical server components integrated onto a single chip, you can build a server by “just adding power and DRAM”. And even that is made easy for our customers with a card-level reference design of four EnergyCore SoCs, power regulators, DRAM, and fabric interconnect. For the last several years, SoCs have been used in embedded systems and mobile devices for the same reasons and benefits discussed above. The server industry is now applying those same lessons learned to it’s own domain. No matter what the design looks like, a better integrated and power optimized Server-on-a-Chip is needed for the scale-out, cluster demands of our Internet generation.